It’s hard to believe that one of the most stable, reputable and popular online casinos, Slotland Casino is already celebrating 20 years in the industry. This stand-alone site, which operates with proprietary software, has certainly stood the test of time and continues to attract players from South Africa and around the world. 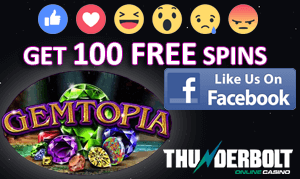 These days, Slotland Casino is right in the middle of its 20-year anniversary celebrations, and this includes the release of a great new slot games for players to enjoy. October promises to be a month full of partying to celebrate the Big Two O. The long-running manager of Slotland Casino, Michael Hilary commented on the birthday celebrations. The festive new Birthday Bash slot has been released this month just in time for 20-year celebration activities. With its traditional birthday symbols such as party hats, balloons and cake, this game looks as good as it entertains. Hold up to four symbols for the next spin so that high value symbols pay out again and again and again. Look out for the wrapped gift scatter symbol. When it lands on the middle reel, it expands to cover the entire reel and activates the bonus game where you select from 15 ‘Pick Me’ buttons and a multiplier of up to 5 times. • Slots and keno: $15 free chip ($25/Bronze, $40/Gold, $60/Gold VIPs) using bonus code BDAYCHIP with 37 x wagering requirement and 7 x maximum cash out. • 75% match bonus using the BIRTHDAY75 bonus code; redeemable once a day, 30 x wagering requirement. 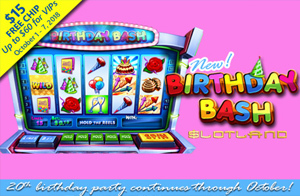 • 100% Match Bonus using bonus code BIRTHDAYBASH, redeemable twice with a 35 x wagering requirement.